2 2 Copyright © 2011 by Mosby, Inc., an affiliate of Elsevier Inc. 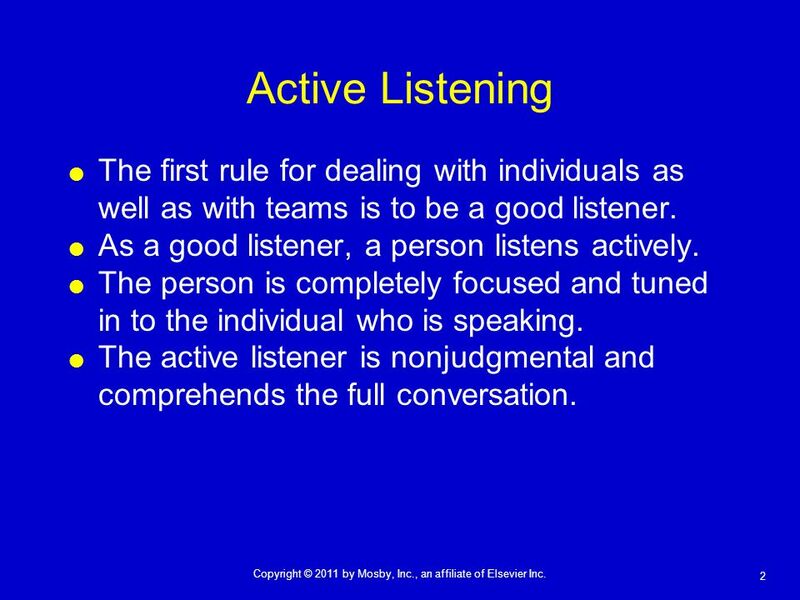 Active Listening The first rule for dealing with individuals as well as with teams is to be a good listener. As a good listener, a person listens actively. The person is completely focused and tuned in to the individual who is speaking. The active listener is nonjudgmental and comprehends the full conversation. 3 3 Copyright © 2011 by Mosby, Inc., an affiliate of Elsevier Inc. 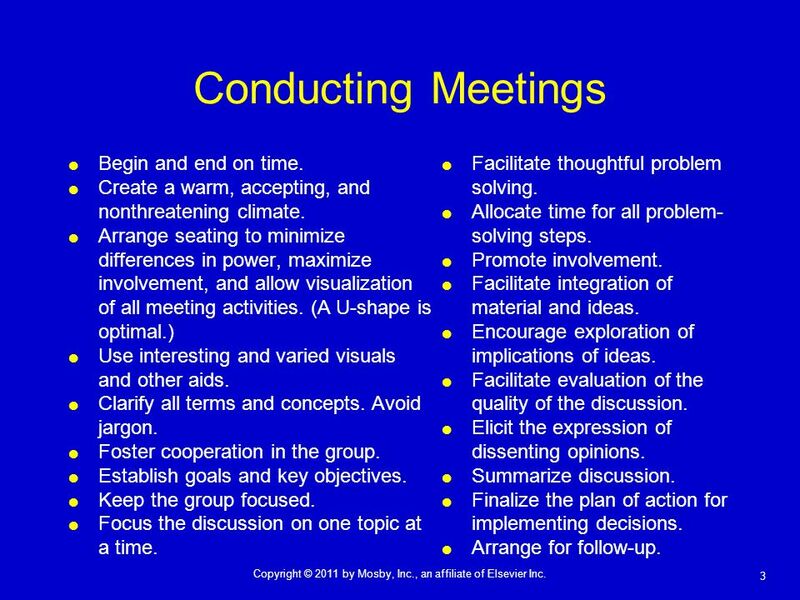 Conducting Meetings Begin and end on time. Create a warm, accepting, and nonthreatening climate. Arrange seating to minimize differences in power, maximize involvement, and allow visualization of all meeting activities. (A U-shape is optimal.) Use interesting and varied visuals and other aids. Clarify all terms and concepts. Avoid jargon. Foster cooperation in the group. Establish goals and key objectives. Keep the group focused. Focus the discussion on one topic at a time. Facilitate thoughtful problem solving. Allocate time for all problem- solving steps. Promote involvement. Facilitate integration of material and ideas. Encourage exploration of implications of ideas. Facilitate evaluation of the quality of the discussion. Elicit the expression of dissenting opinions. Summarize discussion. Finalize the plan of action for implementing decisions. Arrange for follow-up. 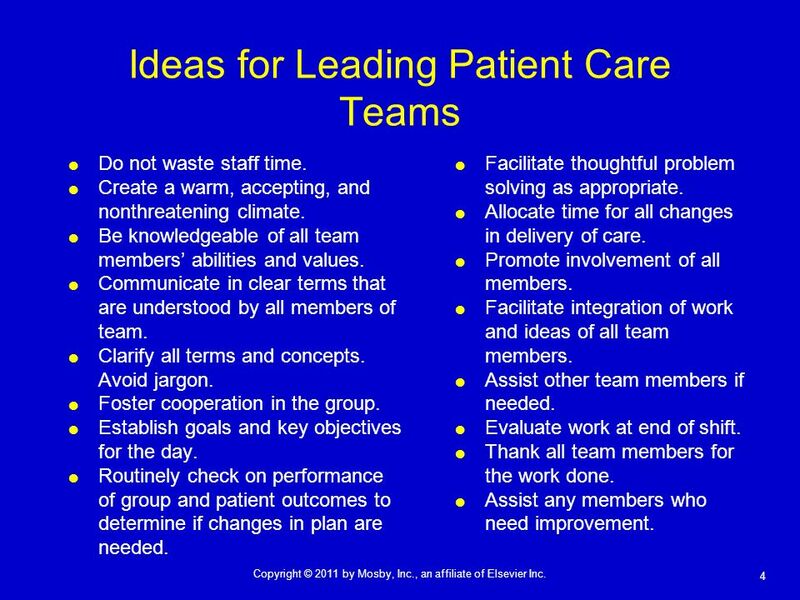 4 4 Copyright © 2011 by Mosby, Inc., an affiliate of Elsevier Inc. Ideas for Leading Patient Care Teams Do not waste staff time. Create a warm, accepting, and nonthreatening climate. Be knowledgeable of all team members abilities and values. Communicate in clear terms that are understood by all members of team. Clarify all terms and concepts. Avoid jargon. Foster cooperation in the group. Establish goals and key objectives for the day. Routinely check on performance of group and patient outcomes to determine if changes in plan are needed. Facilitate thoughtful problem solving as appropriate. Allocate time for all changes in delivery of care. Promote involvement of all members. Facilitate integration of work and ideas of all team members. Assist other team members if needed. Evaluate work at end of shift. Thank all team members for the work done. Assist any members who need improvement. 5 5 Copyright © 2011 by Mosby, Inc., an affiliate of Elsevier Inc. 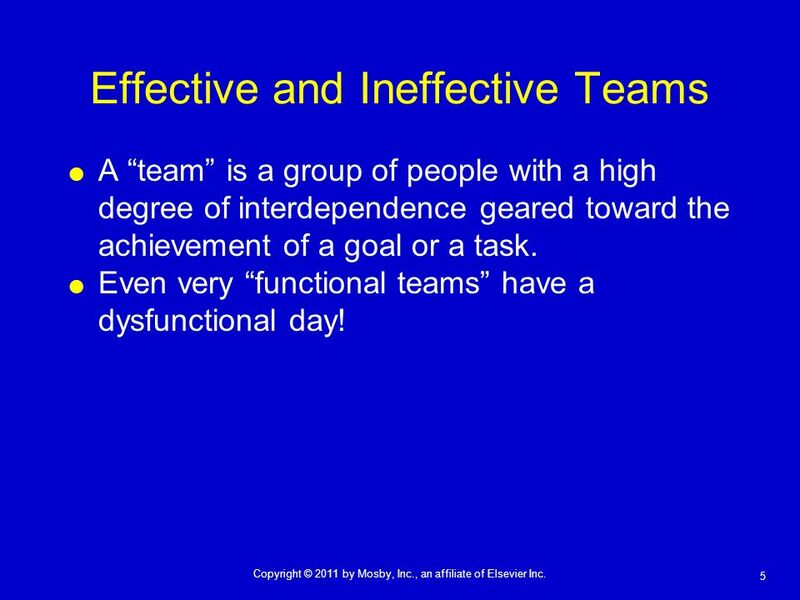 Effective and Ineffective Teams A team is a group of people with a high degree of interdependence geared toward the achievement of a goal or a task. 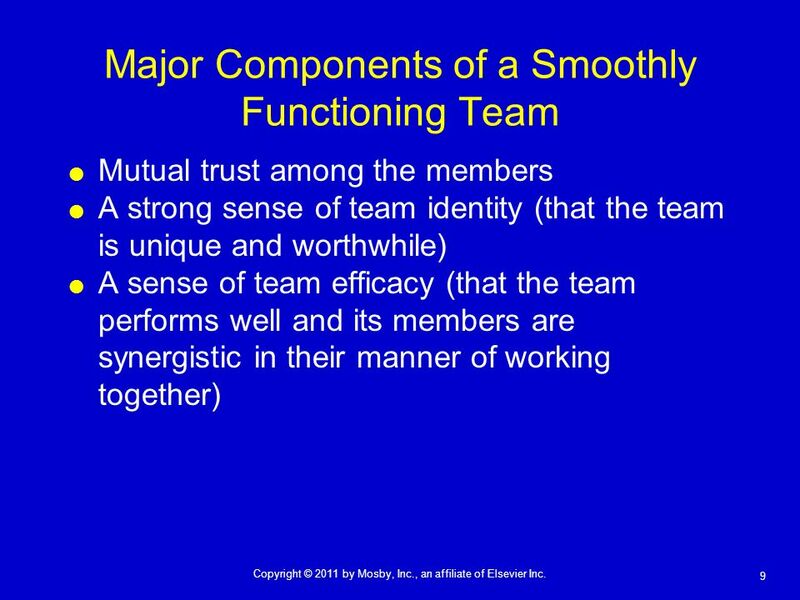 Even very functional teams have a dysfunctional day! 6 6 Copyright © 2011 by Mosby, Inc., an affiliate of Elsevier Inc. Power and Control Whenever there is a team effort, power and control usually come into play. When a person reacts to a situation at the feeling level, there are often blame and judgment calls. People normally would like to believe that their input and contributions are respected and used by the group. 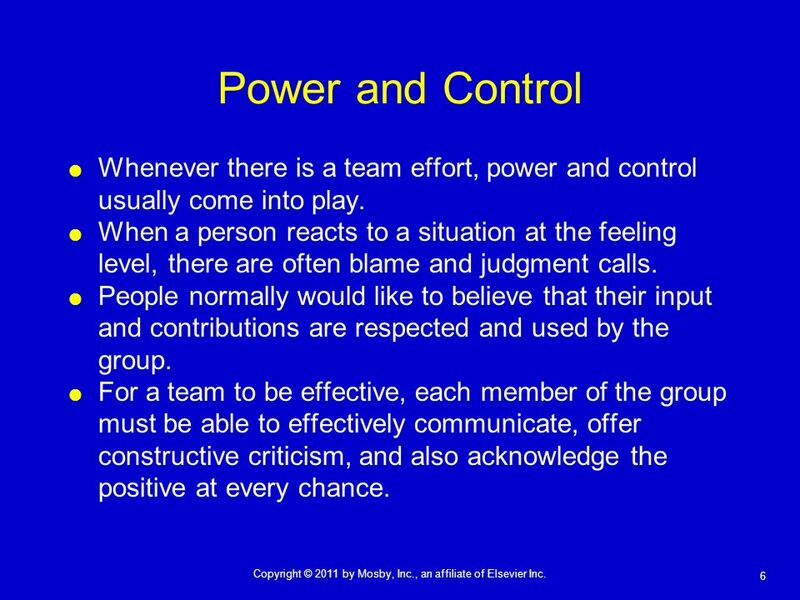 For a team to be effective, each member of the group must be able to effectively communicate, offer constructive criticism, and also acknowledge the positive at every chance. 7 7 Copyright © 2011 by Mosby, Inc., an affiliate of Elsevier Inc. Recognize and Reward Success Everyone makes a difference! Create win-win-wins for your staff. Never let great work go unnoticed! 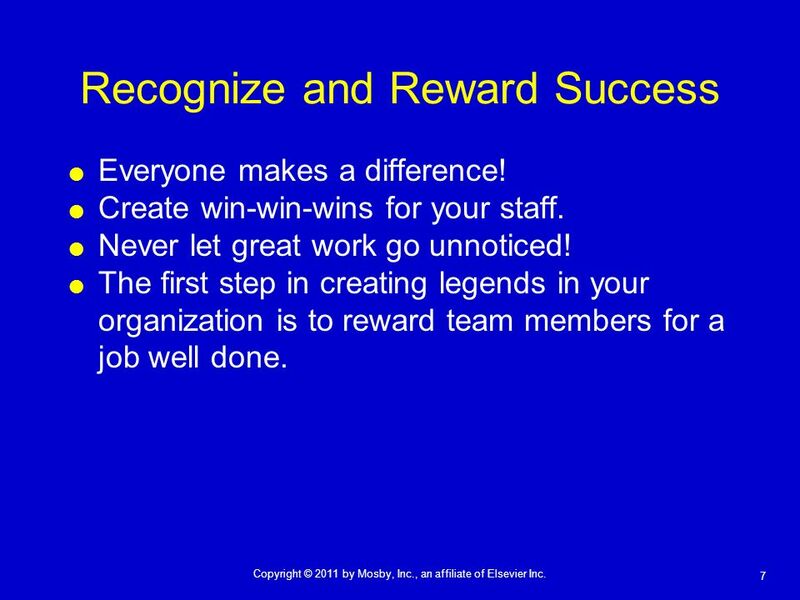 The first step in creating legends in your organization is to reward team members for a job well done. 11 11 Copyright © 2011 by Mosby, Inc., an affiliate of Elsevier Inc. 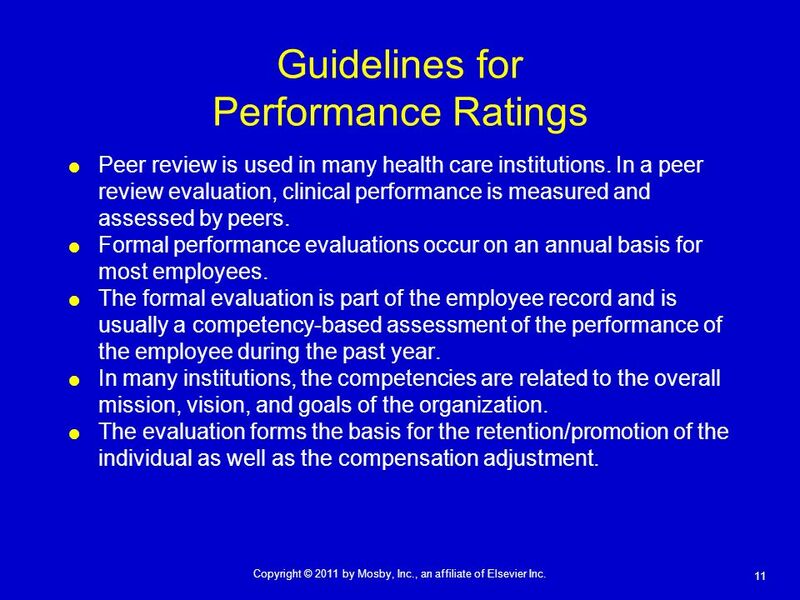 Guidelines for Performance Ratings Peer review is used in many health care institutions. In a peer review evaluation, clinical performance is measured and assessed by peers. Formal performance evaluations occur on an annual basis for most employees. The formal evaluation is part of the employee record and is usually a competency-based assessment of the performance of the employee during the past year. In many institutions, the competencies are related to the overall mission, vision, and goals of the organization. The evaluation forms the basis for the retention/promotion of the individual as well as the compensation adjustment. Download ppt "1 Copyright © 2011 by Mosby, Inc., an affiliate of Elsevier Inc. Chapter 20 Supervising and Evaluating the Work of Others." SMALL GROUP TEACHING. By the end of this session you would be able to : 1- describe different types of small group 2- describe the role of the teacher. Managerial Effectiveness Part II of Training on Personal & Managerial Effectiveness. Leadership ®. 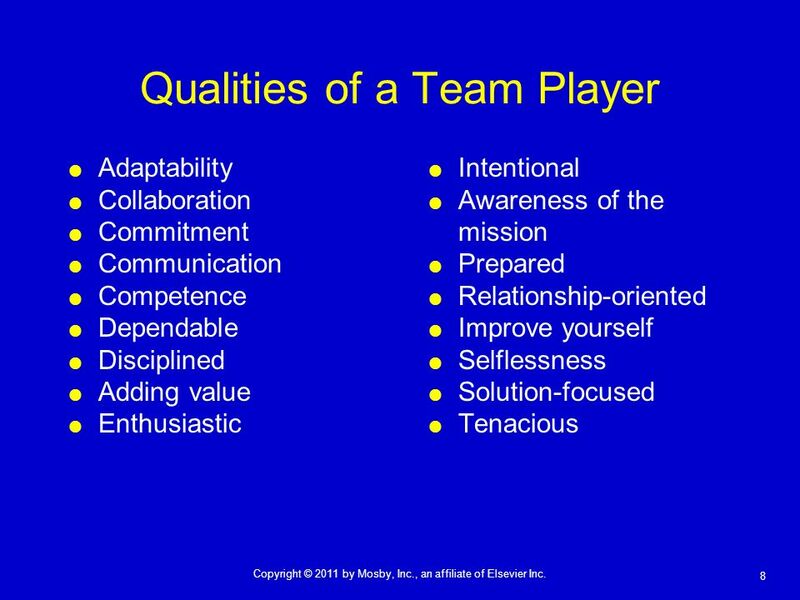 T EAM STEPPS 05.2 Mod Page 2 Leadership ® 2 Objectives Describe different types of team leaders Describe roles and responsibilities. Key Points (Mallory, 1991)  To solve problems by drawing on the talents of variety of individuals.  To foster togetherness in the workplace while. Caring for Older Adults Holistically, 4th Edition Chapter Eleven The Management Role of the Licensed Practical/Vocational Nurse. Interpersonal skills & Communication Edina Nagy Lajos Kiss Szabolcs Hornyák.